Once you click on the “Media Library” button, an additional bar will show up on the right side of the screen. This bar contains the files that you uploaded (“Media Library”) and the files that were shared for download (“Shared Files”). Please click on the “Plus” sign so you can start uploading files. Once they are converted, they will show up on the Media Library bar. 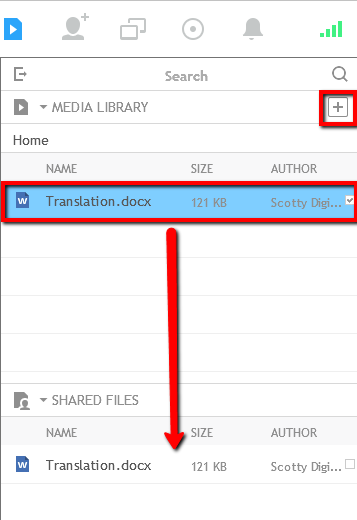 If you want to allow participants in a session to download a document, please select the file within your media library and drag it downwards to the “Shared Files”. This will make a button appear on the bottom of the content share synclet with a download link for anyone to use.